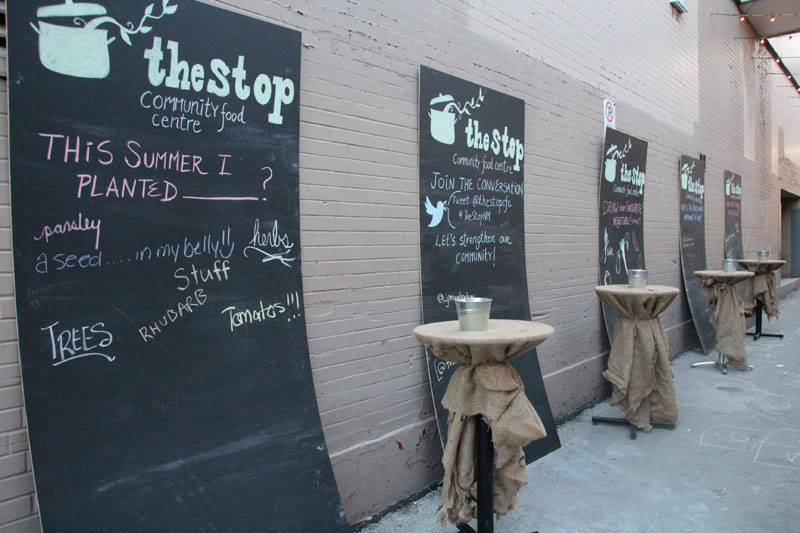 On June 18th and 19th, the Stop Community Food Centre transformed the back alley of the old Honest Eds into the Night Market pop-up mecca for foodies. 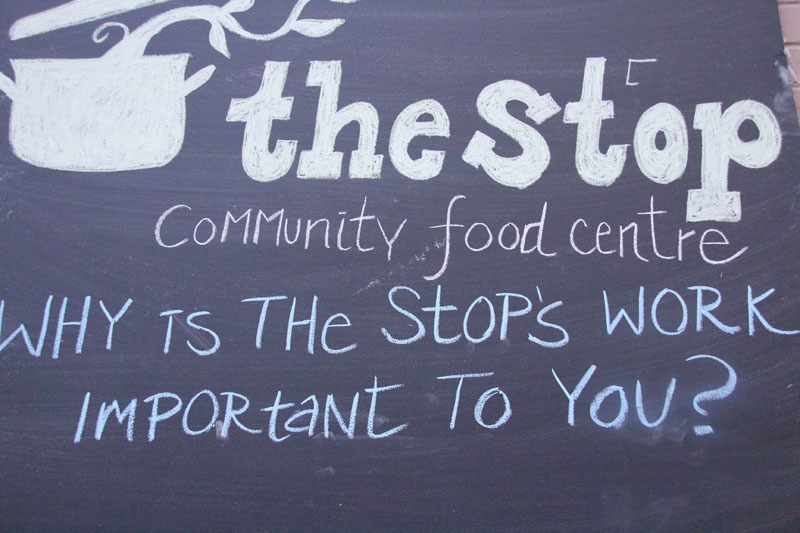 Last year’s single-evening event completely sold out and raised a whopping $57,000 for The Stop, a local Not-For-Profit that provides food bank services, community cooking, food advocacy, and education among other food and nutrition services. Thankfully, their success meant adding a 2nd night to the 2013 event, and watch as the 2000 tickets flew off the online ticket site in under two hours time. This was obviously not a typical food event. 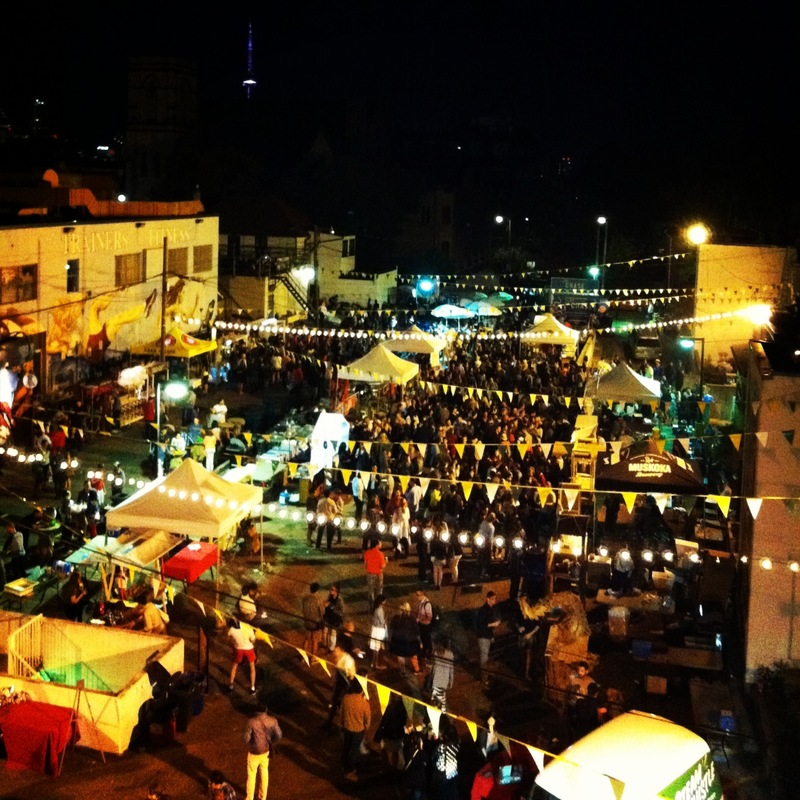 Over the course of the two nights, Night Market saw about 90 local restaurants, wineries, breweries, distilleries and refreshment companies serving up an all-you-can-eat-and-drink feast to hungry (and lucky) ticket holders. In between sips and nibbles, event goers also got a wiggle their hips alongside the remarkably animated dancing band or just admire the stunning vendor booths created by professional and student design teams from schools like OCAD and Ryerson. This year, Yorkshire Valley Farms was a proud sponsor of the event, donating over 160 kg of chicken breasts to the chefs looking to use chicken at the event. The result? When you’re cooking with a premium product from Yorkshire Valley Farm, it’s pretty hard to end up with anything less than tasty, but still, each of the chefs well exceeded all of our lofty expectations! There were tacos, dumplings, wings and more – each dish showcasing the beautiful flavour of YVF, but with such diverse preparations, inspirations and ingredients that the product’s versatility also shown through. Our restaurant partners this year include Babi & Co, Fonda Lola, FeasTO, Hawthorne, 416 Snack Bar and Universal Grill. Padang-Style Pulled Chicken Curry from Babi & Co.
And while all of the YVF chicken dishes at Night Market would have tasted incredible in any place, at any time, knowing that it was contributing to a worthy cause made every bite a bit better. This was certainly the case for James Sculthorpe, President of the company, who believes solely in the Stop’s mandate that everyone, regardless of financial or social situation, should have access to good food. James got into the organic chicken farming business with the dream of making a whole organic chicken less expensive than a large pizza. 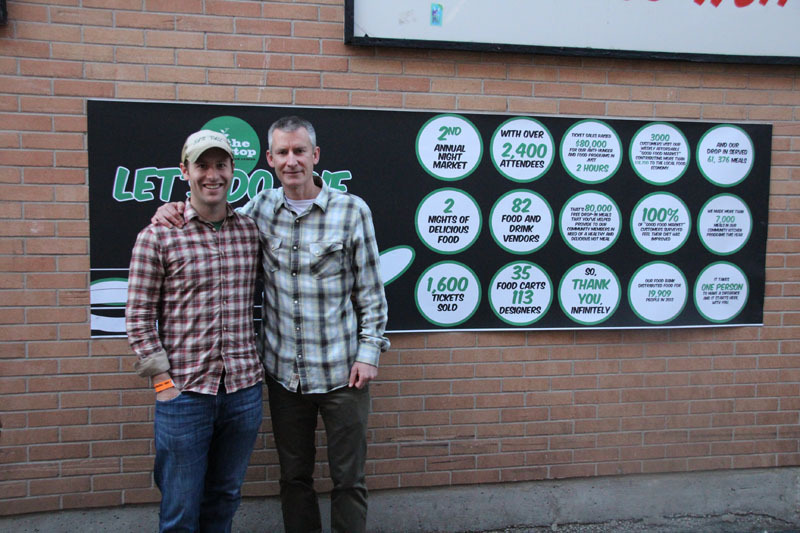 So supporting an initiative that also helps enable families to eat well regardless of budgetary restraints, and that provides healthful, satisfying and culturally acceptable food through their food bank, was a perfect fit for the Farm. But don’t fret if missed out on some of the Night Market’s delicious chicken dishes. 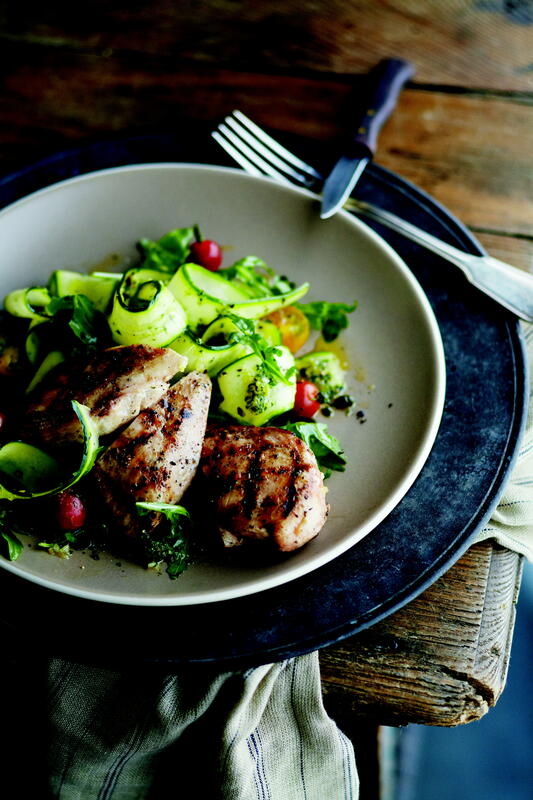 You can pick up a package of Yorkshire Valley Farms chicken breasts, take a little inspiration from the pros and whip up your own healthy version at home! And while you perfect your own chicken dinners, check out the Stop website for more information about their important initiative and programs, and be on the look out next Spring for information on the 2014 event. In a 1-gallon resealable plastic bag, mix the buttermilk, mustard, 1 tablespoon onion powder, 1 teaspoon salt, 1 tea- spoon dry mustard, 1 teaspoon cayenne, and 1 teaspoon pepper. Add the chicken pieces. Seal the bag, eliminating air. Turn the bag to coat the chicken evenly. Refrigerate at least 1 day and up to 2 days, turning bag occasionally. Whisk the flour, baking powder, garlic powder, remaining 1 tablespoon onion powder, 4 teaspoons salt, 3 teaspoons dry mustard, 3 teaspoons cayenne, and 11⁄2 teaspoons pepper in a 13 by 9-inch glass dish. With marinade still clinging to the chicken pieces (do not shake off excess), add the chicken to the flour mixture, turning to coat thickly. Let the chicken stand in the flour mixture for 1 hour, turning chicken occasionally to recoat with flour mixture. Pour the oil to a depth of 11⁄4 inches into a 10- to 11-inch pot. Attach a deep-fry thermometer. Heat the oil over medium-high heat to 350°F. Add 4 pieces of chicken, skin side down. Reduce the heat to medium-low and fry 5 minutes, adjusting heat to maintain oil temperature between 280° and 300°F (oil should bubble constantly around chicken). Using wooden spoons, turn the chicken over. Fry 7 minutes. Turn the chicken over again. Fry until deep golden brown and cooked through, about 3 minutes longer. Using the same spoons, transfer the chicken to a large rack set on a baking sheet. Reheat the oil to 350°F. Repeat frying with the remain- ing 4 pieces of chicken. Serve the chicken warm or at room temperature within 2 hours, or chill up to 1 day and serve cold. Excerpted from The Epicurious Cookbook. Copyright © 2012 Tanya Steel and the Editors of Epicurious.com. Published by Appetite by Random House, which is a division of Random House of Canada Limited. Reproduced by arrangement with the Publisher. All rights reserved. 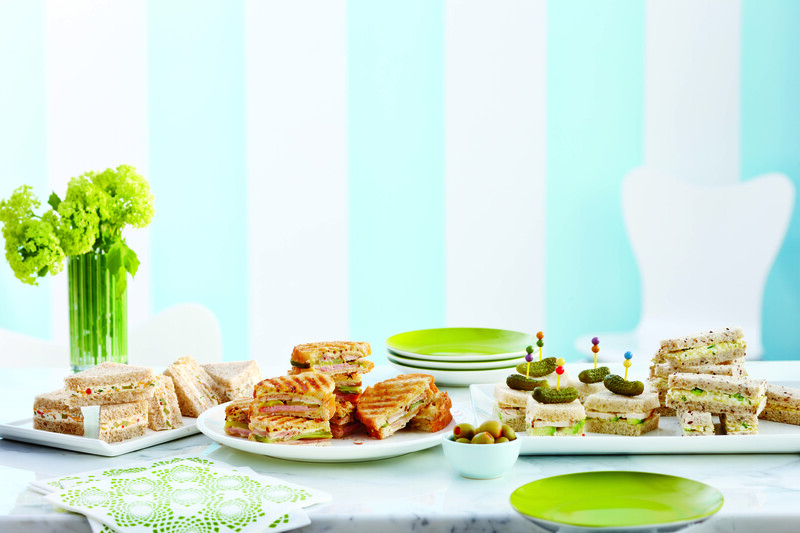 Dress up these sammies for a party with frilly picks and a little pickle or olive. In shallow dish, stir together lime juice, oil, salt, pepper and hot pepper flakes; add chicken, turning to coat. Place chicken on greased grill over medium-high heat; close lid and grill, turning once, until no longer pink inside, 15 to 20 minutes. Let cool. (Cover and refrigerate for up to 8 hours.) Cut crosswise into ¼ inch (5 mm) thick slices. Set aside. Stir together mayonnaise, lime zest, lime juice, hot pepper flakes, cumin and salt; spread on bread slices. Peel, pit and thinly slice avocados; sandwich avocado and chicken slices in bread, pressing lightly. Trim off crusts. Cut each sandwich into 4 squares or triangles; secure each with toothpick. Excerpted from Canadian Living: The Appetizer Collection. Copyright © 2013 Canadian Living. Published by Transcontinental. Reproduced by arrangement with the Publisher. All rights reserved. Preheat oven to 200°F. Fill a large, deep skillet with 1 inch of oil; heat over medium-high until it returns to 375°F on a deep-fry thermometer. Working in batches, fry chicken until golden brown and cooked through, 6 to 7 minutes per side. Transfer to a paper towel–lined baking sheet in oven to keep warm. Adjust heat so oil returns to 375°F between batches. In a large bowl, stir together hot sauce and melted butter. Add chicken and toss to coat. 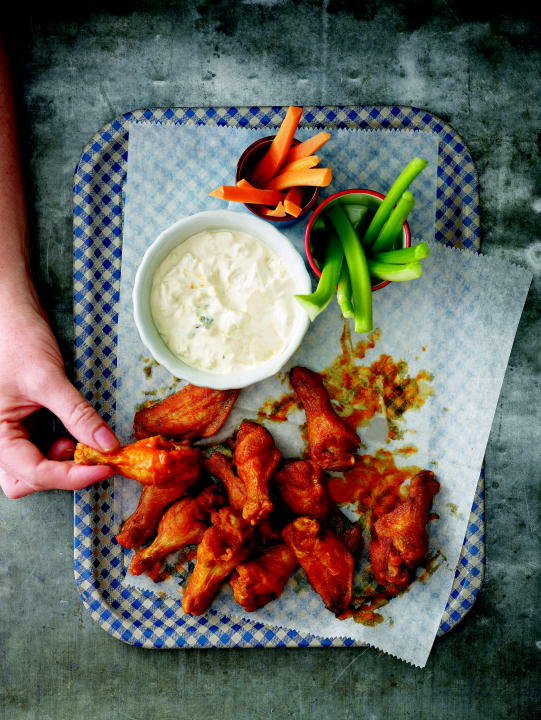 Serve wings with dipping sauce and celery sticks. In a small bowl, stir together sour cream, mayonnaise, milk, and salt. Stir in blue cheese. Refrigerate, covered, until ready to serve, up to 2 days. 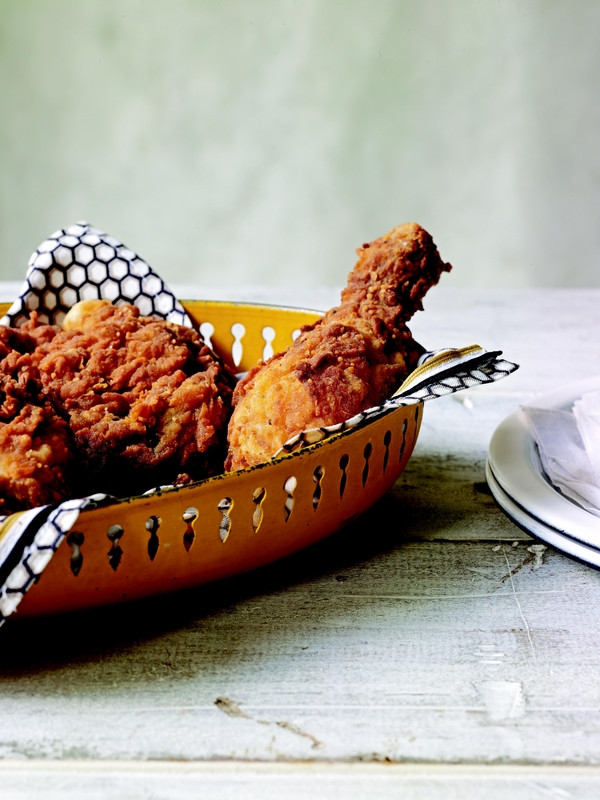 Excerpted from Martha Stewart’s Martha’s American Food. Copyright © 2012 by Martha Stewart Living Omnimedia, Inc. Published by Clarkson Potter/Publisers. Reproduced by arrangement with the Publisher. All rights reserved.